S K Williams Property Cleaning Services carry out driveway cleaning and driveway sealing, in Telford, Shrewsbury, Newport, Stafford, Codsall & surrounding areas. 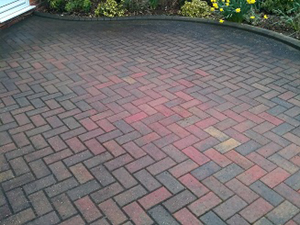 We aim to provide a complete driveway cleaning, restoration and sealing service. With over 8 years experience of driveway cleaning in Telford, Shrewsbury and in Shropshire & Staffordshire, we have a wealth of knowledge that we can draw on. We are Shropshire's only Smartseal Registered Installers, fully trained to provide and apply BS & ISO standard sealers oils & stains. These are not 'own-brand' products, but are first class, top-grade professional sealers, oils and stains. We carry out block paving driveway cleaning in Telford, Shrewsbury, Shifnal, Newport, Stafford, Codsall & surrounding areas. Over time, block paved areas can become infested with weeds and moss and look quite unsightly. We can provide a complete overhaul to your block paving and leave it looking fresh and bright, improving the overall lok of your property. We pre-treat block paving to kill off weeds, moss and algae. 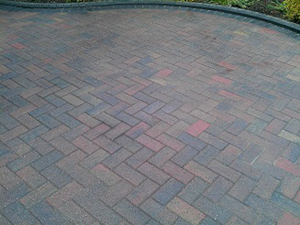 We then clean the block paving, re-sand the block paving and we highly recommend sealing block paving. Sealing your surface will make the sand set hard, inhibiting future weed and moss growth. It also waterproofs the surface, protecting your blocks from frost damage. At the bottom of this page, you will see the full list of benefits from block paving sealing. 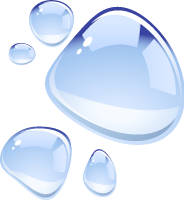 Please contact us and we can provide information sheets explaining in detail the cleaning and sealing processes and the benefits thereof. 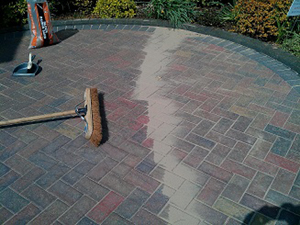 We pre-treat, clean, re-sand and seal block paving. Tarmac Cleaning, Restoration & Sealing. 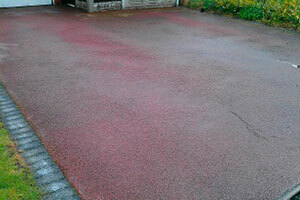 We carry out tarmac cleaning, restoration and sealing in Telford Shrewsbury, Stafford, Codsall and surrounding areas. Tarmac is a very durable surface, but like all outdoor surfaces, it is not maintenance-free and its life can be extended through proper maintenance and care. We have training for effectively killing off moss, cleaning, restoring and sealing the tarmac. Benefits include bringing back the original dark colour, and providing flexibility into the tarmac again which will inhibit 'chipping'. It will also prevent the tarmac from bleaching in the sun. As a general rule, if your tarmac looks a different colour when wet, the reins in the tarmac have dried out and your tarmac will have long term protection after being sealed. 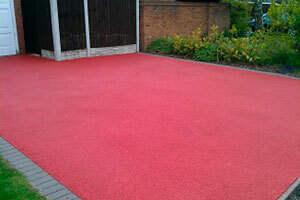 We can also repair dips and cracks in tarmac and seal tarmac, smartening up the overall look of the driveway. At the bottom of this page, you will see the full list of benefits from tarmac cleaning and sealing. Please contact us and we can provide information sheets explaining in detail the cleaning and sealing processes and the benefits thereof. We clean, restore and seal tarmac to make your driveway look like new. We carry out pattern imprinted concrete cleaning, tinting & sealing in Telford, Shrewsbury, Stafford, Codsall and surrounding areas. Pattern imprint concrete can last for a very long time, but it can fade and wear in the wrong conditions, so does require a degree of maintenance. 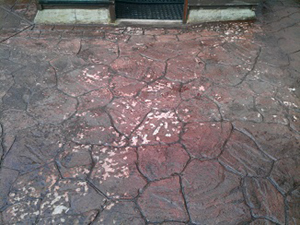 We have been trained to repair and seal imprinted concrete. It requires a professional to do this, it is not an easy DIY job. We clean, repair cracks and chips in the pattern imprinted concrete, then re-seal and if required, re-tint pattern imprinted concrete. As you can see from the pictures, the difference is very impressive. Imprint concrete driveways often have 'trainlines' from car tyres repeatedly driving over the same area. If salt is applied in the winter, this will eat through any sealer that is present within 24 hours and leave the concrete exposed to the damaging effects of the rain and frost. We can repair and reseal even the most badly damaged imprint concrete driveways, so please feel free to contact us if you think yours in in need of some TLC. 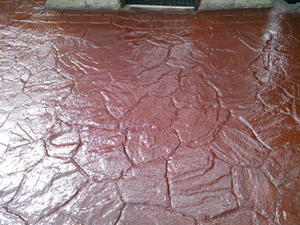 At the bottom of this page, you will see the full list of benefits from imprinted concrete cleaning and sealing. Please contact us and we can provide information sheets explaining in detail the cleaning and sealing processes and the benefits thereof. Cleaning, tinting and sealing imprinted concrete breathes new life into it. 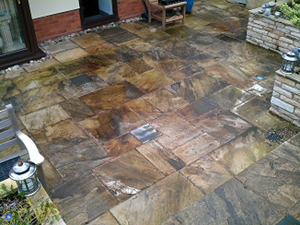 We carry out patio cleaning and patio sealing in Telford, Shrewsbury, Stafford, Codsall and surrounding areas. We pre-treat the patio to kill off live growth, provide a penetrating clean and offer a range of patio sealers that give long-term protection. I was delighted when I saw the result of the recent cleaning on the slabs in my rear garden. Each of them has been restored to as-new condition and as a result, the appearance of the whole garden has been uplifted. It was money well spent – and I would recommend Steve to anyone. 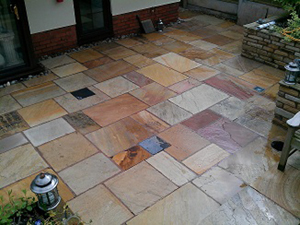 We pre-treat, clean and seal patio slabs and stone. We carry out wooden decking cleaning, decking oiling & decking staining in Telford, Shrewsbury, Stafford, Codsall and surrounding areas. We pre-treat the decking to kill off algae, clean the decking, and provide and know how to apply decking oils and decking stains to a professional standard. We have a whole range of colours of decking oils and decking stains available. 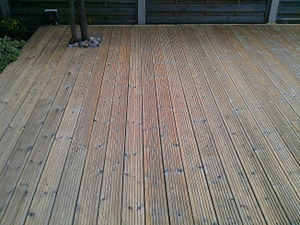 I am really pleased with the results of the decking treatment and stain from this company! Good advice and great service. You have made my decking look like new again! Thanks!!! 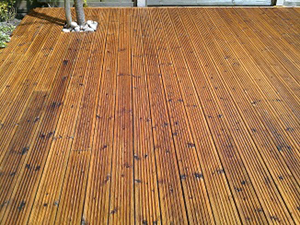 Dangerous, mouldy, slippy decking can be pre-treated, cleaned and re-stained. Our aim is to provide a complete package for your driveway, patio or decking, consisting of a pre-treatment, penetrating clean, surface restoration, re-sand where necessary and a protective sealing or oiling. This with help you protect your investment as well as leaving you a clean, bright surface with protection that will last years. Many of our customers across Telford, Shrewsbury, Newport, Bridgnorth, Market Drayton and the rest of Shropshire are finding our block paving and driveway restoration treatments to be an excellent way to brighten up and add value to their property.